From the news we last received, there is this: there is a desire to place the American Flag atop the Palace, and the Government House, and the other flag poles of the nation, however, some of the high officials of Other Nations protest that act vehemently, and that is why it has slightly died down. THE ROYAL STANDARD OF HAWAII. Crown Room of Iolani Palace, 1936. 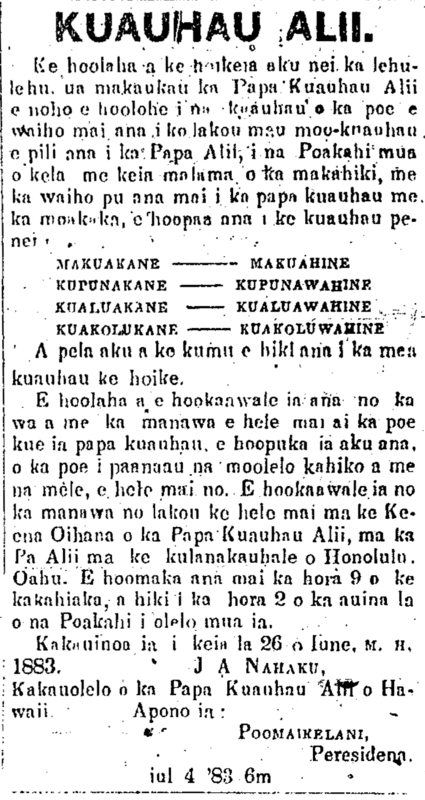 Poomaikelani’s search for alii genealogies, 1883. And so forth until the earliest that the genealogist can show. A notice will be given and time will be set aside for those who object to the genealogies that will be published, for those who know the old stories and mele, you come as well. Time will be set aside for them to come to the Business Office of the Papa Kuauhau Alii, on the Palace Grounds in the town of Honolulu, Oahu. Commencing at 9 o’clock in the morning, until 2 o’clock in the afternoon on the Mondays mentioned previously. 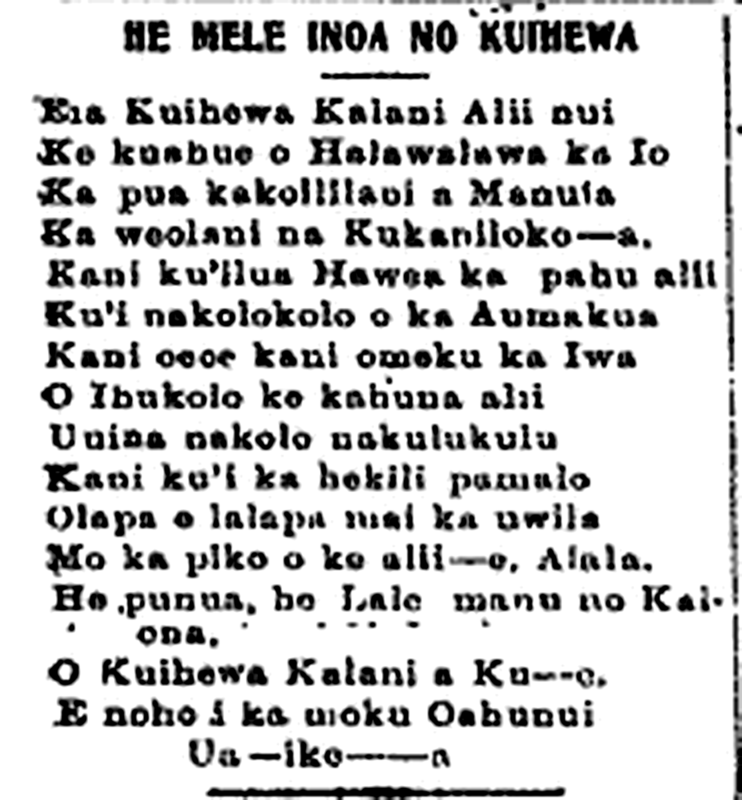 Ka Elele Poakolu, Buke IV, Helu 31, Aoao 4. Augate 1, 1883. Christmas tree at Iolani Palace, cont’d, 1910. CHILDREN WAITING TO RECEIVE PRESENTS. CHRISTMAS TREE LADEN WITH PRESENTS. …two years ago, after discussion, they decided that it would be a fine thing to give presents to the children of this town, whereupon they collected money to purchase gifts and to do everything that would it enjoyable for them. Christmas tree at Iolani Palace, 1910. Children lined up before the Executive Building to Receive Presents. The Visitors along with the Children were Drenched in the Falling Rain on that Morning. Two years have past since the start of the giving of a Malihini Christmas Tree heavy with presents of all sorts to the indigent children, and this year it seems as if there was the most presents collected along with the most children, reaching more than about two thousand, but showers coming down when the presents were being handed out was problematic for the little children and the gifts as well, and many of the presents were damaged.